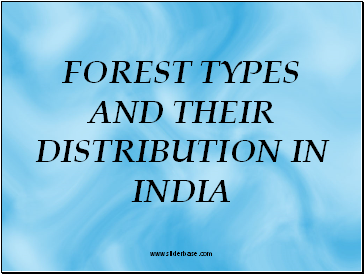 Forest constitute one of the most important basic natural resources of the country. 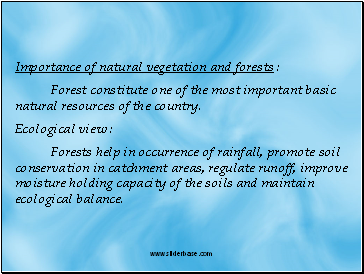 Forests help in occurrence of rainfall, promote soil conservation in catchment areas, regulate runoff, improve moisture holding capacity of the soils and maintain ecological balance. 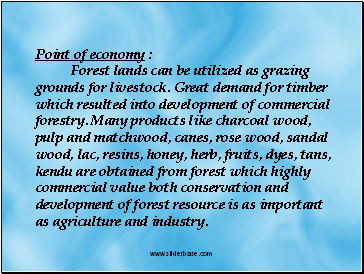 Forest lands can be utilized as grazing grounds for livestock. 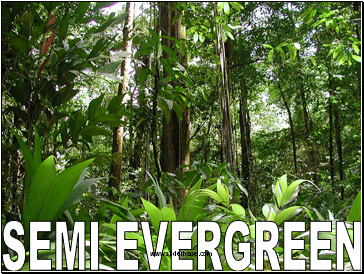 Great demand for timber which resulted into development of commercial forestry. Many products like charcoal wood, pulp and matchwood, canes, rose wood, sandal wood, lac, resins, honey, herb, fruits, dyes, tans, kendu are obtained from forest which highly commercial value both conservation and development of forest resource is as important as agriculture and industry. 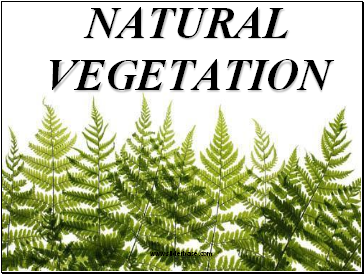 Terrain, climate, soil and water conditions greatly influence the character and type of vegetation. The Himalayan region, possesses a variety of vegetation with a distinctive character of alpine type at higher altitudes and this region is clearly distinguished from the rest of the country. 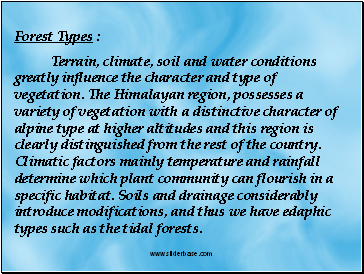 Climatic factors mainly temperature and rainfall determine which plant community can flourish in a specific habitat. Soils and drainage considerably introduce modifications, and thus we have edaphic types such as the tidal forests. 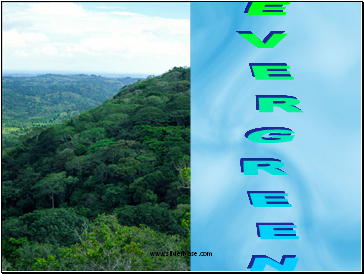 Tropical wet evergreen and semi evergreen forests are found in Southern Western Ghats, north-eastern India and Plains of West Bengal with altitude ranging from 500-1500 mts and rainfall exceeding 200cms. 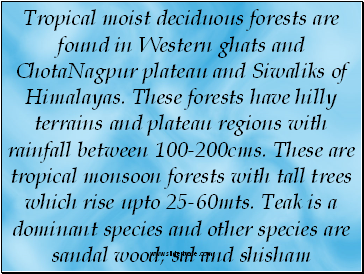 Height of trees is from 45-60mts.Vegetation is very dense. 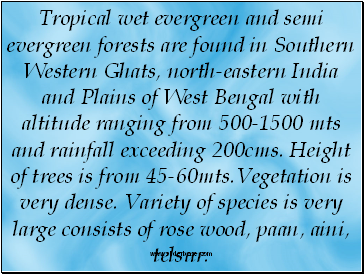 Variety of species is very large consists of rose wood, paan, aini, telsur.